Check out who will win today? In Today’s Dream11 Fantasy Cricket Prediction MI vs KKR 41st T20 Match IPL 2018, we will cover predicted playing 11, pitch report of Eden Gardens, Kolkata and toss prediction. We will also cover players recent and past performance, dream11 guru prediction, all the latest news and updates of Kolkata Knight Riders and Mumbai Indians teams, key players dream11 best teams, the best choice for captain and vice-captain, weather report of Kolkata, where to watch live match of KKR vs MI and details of live streaming. All the details and statistics are taken from reliable sources. Make sure to read the complete post to get 100% benefit. Reading the post will not cost you anything as all the details on this post are absolutely free. Every section has some tips, so make sure to read each and every section. Where Can You Watch the Live Streaming of KKR vs MI or Channels to Watch? Who Will Win the 40th Match of IPL 2018 Between MI vs KKR and Toss Prediction? What is the best combination of players for Dream11 in 41st Match? 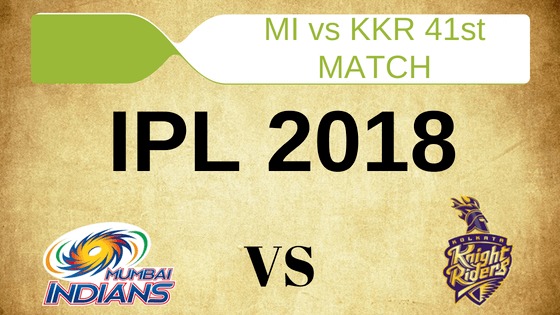 Match: Indian Premier League, KKR vs MI, IPL 2018. In a last couple of years, the pitch of Eden Gardens was a slow pitch but the story is different now. It favours the seamers. The pitch is good for batting as it has a good bounce in the wicket. The batsmen can easily play on the rise shots and can trust the bounce of the wicket. It will have even bounce, so the batsman can go for big shots. It is predicted that on Wednesday morning there will be an isolated thunderstorm. In the second half of the day, we will see clouds and there will be winds. Cricket fans can get the full game as no rain is predicted at the time of the play. The sky will be clear at that point in time. The temperature is expected to 31-Degree Celsius and the humidity to be 79%, which may rise up to 85%. If you are KKR fan then this may surprise you. In last five matches, KOL has not won a single match against MUM. MI has won all the five matches. In overall encounters, Mumbai Indians has won 17 matches whereas Kolkata Knight Riders have won five games. At Eden Gardens MUM has won six matches out of eight games. Star Sports has paid a huge amount of INR 16,347.50 Crores to get exclusive rights of IPL 2018 for live coverage for five years starting from 2018 to 2022. Star Sports has all the media rights including TV and all Digital Rights. You can watch the full match of Mumbai Indians vs Kolkata Knight Riders, 41st match on Star Sports. Ishan Kishan (wk), Hardik Pandya, Rohit Sharma (c), Jean-Paul Duminy, Suryakumar Yadav, Kieron Pollard, Evin Lewis, Mayank Markande, Krunal Pandya, Pradeep Sangwan, Ben Cutting, Sharad Lumba, Mitchell McClenaghan, Akila Dananjaya, Jasprit Bumrah, Tajinder Singh, Mustafizur Rahman, Aditya Tare, Rahul Chahar, Adam Milne, Mohsin Khan, Saurabh Tiwary, MD Nidheesh, Siddhesh Lad, Anukul Roy. Robin Uthappa, Dinesh Karthik (c & wk), Tom Curran, Chris Lynn, Piyush Chawla, Shubman Gill, Andre Russell, Rinku Singh, Cameron Delport, Nitish Rana, Prasidh Krishna, Kuldeep Yadav, Sunil Narine, Javon Searles, Ishank Jaggi, Mitchell Johnson, Shivam Mavi, Vinay Kumar, Apoorv Wankhade. Since April 2015, Kolkata Knight Riders has not defeated Mumbai Indians and they will definitely want to win today’s match. It will be interesting to see what changes KKR makes for their winning combinations. We will provide you with the possible changes in the next section. If Shivam Mavi is declared fit then he will replace Prasidh Krishna. Mitchell Johnson has conceded too many runs in the previous matches, so Tom Curran may replace him. Except for these changes Dinesh Karthik will go with the same playing 11. Sunil Narine, Shubman Gill, Chris Lynn, Kuldeep Yadav, Robin Uthappa, Mitchell Johnson/Tom Curran, Nitish Rana, Andre Russell, Prasidh Krishna/Shivam Mavi, Dinesh Karthik (capt & wk), Piyush Chawla. Mumbai Indians defeated Kolkata Knight Riders by 13 runs in the previous game. If MI want to go to playoffs, they have to win each and every match from here and Rohit will not think of disturbing their winning combination until and unless there is a fitness issue. It is expected that MI will play with the same playing 11. Evin Lewis, Ishan Kishan (wk), Suryakumar Yadav, Mayank Markande, Rohit Sharma (capt), Jasprit Bumrah, Krunal Pandya, Ben Cutting, Hardik Pandya, Mitchell McClenaghan, JP Duminy. Note: One of the most important thing in winning in a fantasy league is all the players should play and if you have playing 11 lists while making your team then things get easier. Pro tips: You can take Dinesh Karthik on your team as he is in excellent form. Make a combination of players for multiple teams. Pro tips: Make a combination of players from the above players. Narine, Krunal, and Hardik are most likely to perform today. You can take them in your dream11 team. Pro tips: The above players have more chances of taking wickets in today’s match. Make a combination of bowlers for multiple teams. Pro tips: The above players have performed in the previous matches. You can take them as a captain and vice-captain. You can also take captains from key players. It has been 1127 days, 7 matches and three seasons of IPL and KKR have not won a match against MI. Kolkata will definitely want to break this stats. According to cricket experts, Mumbai Indians will win the match and according to our astrology prediction also MUM will win today’s match. 66.67% of the games were won by teams you elected to bowl first after winning the toss in last 12 matches. We will see the same thing in today’s match also. The team winning the toss will opt to bowl first. According to our astrology prediction, Mumbai Indians will win the toss and opt to bowl first. Try to fill your team with all-rounders in your team. Mayank Markande is a must have player. Select hard hitters in your dream11 teams. Don’t forget Rohit Sharma, he is a must-have player in any team as his record in Eden Gardens is speechless. Try to take spinners from the KKR team as they have taken 21 wickets in their home ground. Conclusion: This is it for Today’s Dream11 Fantasy Cricket Match Prediction of MI vs KKR, 41st T20 Match, IPL 2018 which will be played on Wednesday 9th May. You can give your valuable feedback in the comment section. Subscribe to our notification of latest updates. GOODBYE!